Pick through the crab to remove any remaining bits of cartilage and shell. Mix the crab, cream cheese, lemon zest and juice, salt, pepper and chives together. Taste and adjust seasoning. 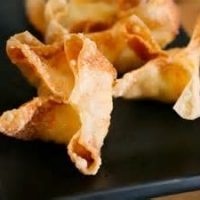 Place a heaping half-teaspoon of filling on one corner of the wonton skin, leaving the edges clean. Moisten the edges with egg wash. Bring one set of opposite corners together and seal all the edges, making a triangle. Next, bring the long ends of the triangle together, overlapping the corners slightly and sealing with more egg wash. Turn the third corner up if it isn't already, forming a small tortellini or hat-shape. Alternate folding method: Cut the wonton skins in half, diagonally. Brush one side with egg wash then place a small dollop of filling a bit off the middle of the triangle. Bring the open edges together and seal, forming a small triangle. Meanwhile, heat the oil to about 350 degrees F. Fry the wontons until they are golden brown, about 45 seconds to 1 minute. Drain well on a rack lined with paper towels.